I am truly confused. I’ve been able to save some money recently and I’ve stopped to think on how and where I should invest it. One of the rules of thumb of investments is to invest for the long term. If your investment period is long enough stocks will eventually yield the highest possible return compared to all other options. While this rule of thumb has proved itself in the past the future is a whole other matter. Furthermore, as an investor I’m constantly asking myself are price levels justified? Are stocks priced correctly? 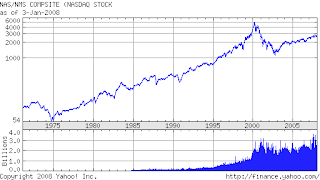 We only need to take a look at a poor investor who decided to invest some of his savings in the Nasdaq Index somewhere in early 2000 when the Nasdaq hovered over 5,000 points. This investor has yet to see his original capital investment. Not to mention losing 8 years of alternative return on investment. 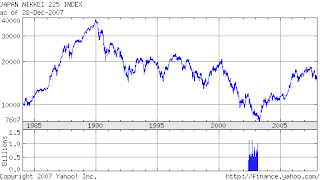 Another, even better, example is having invested in Japan’s Nikkei Index somewhere in the 1990’s in levels of almost 40,000 points only to find that today, after almost 18 years, the Nikkei toys around 15,000 points. Naturally rules of thumb are not always correct. Acting on induction or action based on past performance is logically wrong but we have little choice in the matter as only the past is known. As a result the question I’m constantly asking myself is are markets today priced correctly? In my post about The Financials of 2008 I quoted Blumberg on the Chinese market. The Chinese market is a wonderful long term investment opportunity but it seems there is a bubble evolving in it. Chinese stock prices have risen to imaginary worth. PetroChina’s market cap is 39% that of Axon Mobile with 50% of the profits. China Mobile’s market cap is 41% that of T&T with 75% of the profits. Stocks in the CSI 300 index are traded at a P/E multiplier of 44.7! The US economy is very edgy and markets have performed quite nicely since 2003 (even if returns where amongst the lowest when compared to other markets). So, Do I have good reasons to be concerned? I believe so.